It’s now over a year since I started keeping a comic diary, inspired by homework set on the Graphic Novel course I did last year at the Royal Drawing School, with excellent teaching by comics artist Emily Haworth Booth. I no longer do it every single day, usually a couple of times a week, but it has proved a wonderful space to reflect and record all the hundreds of small things that make up day-to-day life, and otherwise just get forgotten. I’ve got lots of entries inspired by all the funny things the three-year-olds say at my under 5s art group, one about unblocking the sink, and rather a lot involving a pint of beer at the pub. Dipping back into my comic diary from last year brings back so many things that would have been lost forever otherwise, so thankyou Emily for getting me started! 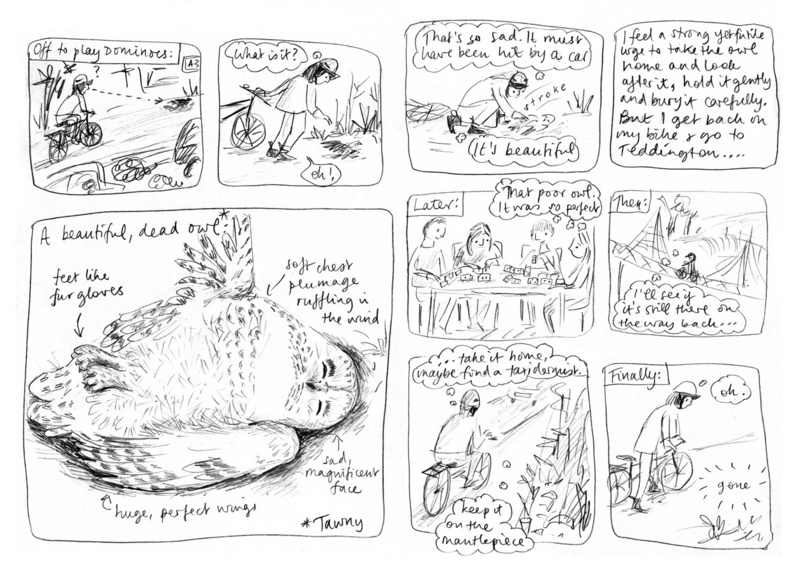 Here’s a sad one from last weekend, featuring a dead owl and a game of dominoes. This entry was posted in birds, Illustration on March 2, 2016 by Jane Porter.